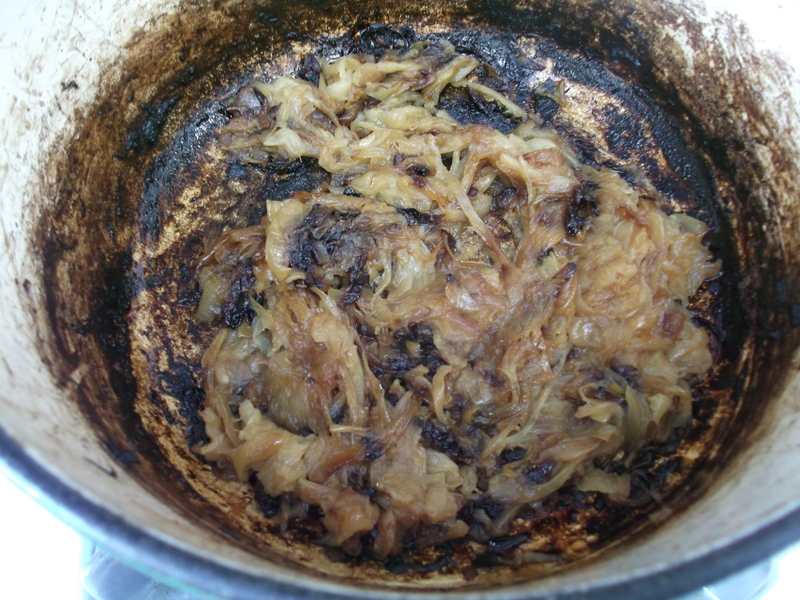 If you have ever had to caramelize onions, you know what a long and arduous process it can be. It can take a good hour or more, constantly stirring and scraping, and vigilantly monitoring the stove so the onions brown but don’t scorch. Thanks to Cook’s Illustrated magazine, there is a much easier way to do this. While the overall process takes longer (roughly 3½ hours from start to finish), this is a mostly hands-off procedure that frees up a great deal of your time. Give this method a try and you will not be disappointed! 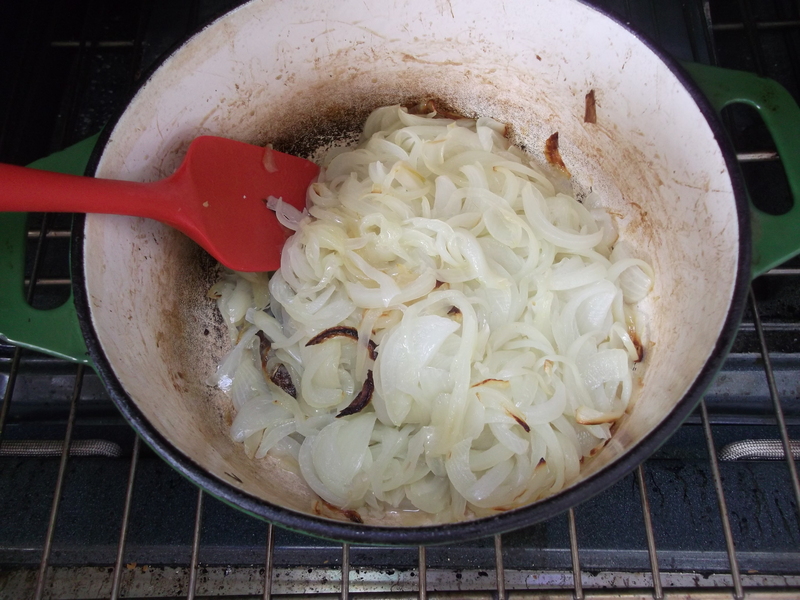 I used this method to caramelize onions in a 3½ quart Dutch oven for my French onion soup. Adjust oven rack to lower-middle position and preheat oven to 400 degrees F.
Slice (or dice) the onions. This is about two pounds’ worth. Onions sliced pole to pole hold up better in the cooking process, but depending on your needs, you can slice them in either direction, or even dice them. Here, I trimmed both poles (the root end and the top), cut the onion in half (pole to pole also), and sliced pole to pole. 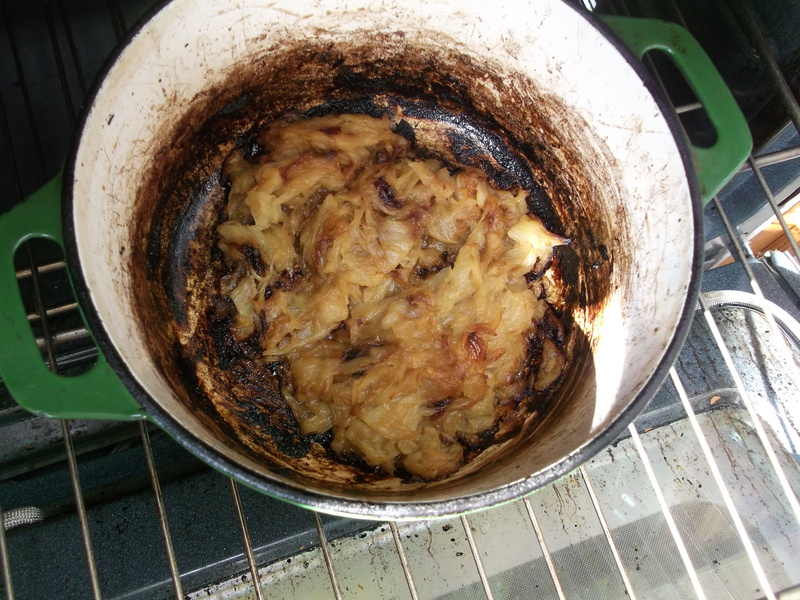 Spray the inside of Dutch oven (or other large covered, heavy-bottomed pot) with oil or nonstick cooking spray. 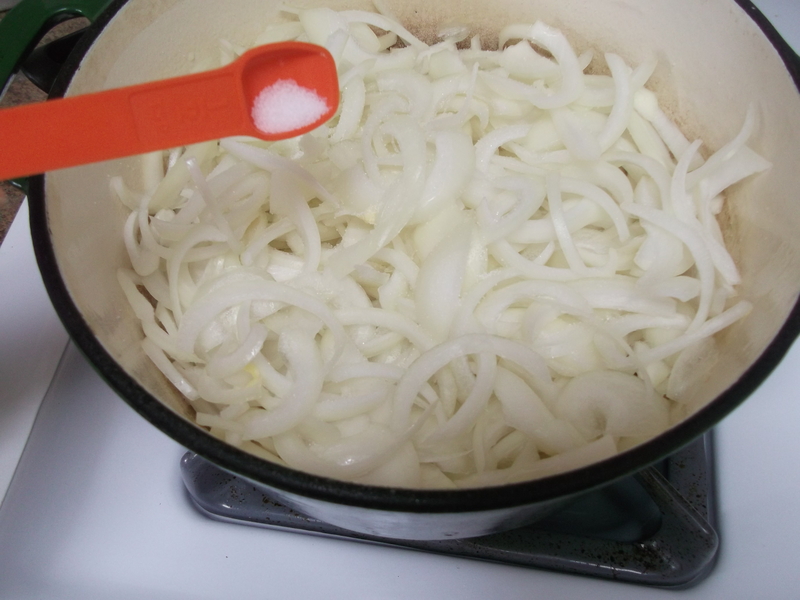 Place the pieces of butter in the pot, then add the sliced onions, separating them with your fingers. Sprinkle the onions with ½ t salt. Cover the pot, place it in the oven and cook for one hour, stirring once or twice to prevent burning. The onions will be moist and will have reduced a little in volume. After one hour, stir the onions well again, scraping bottom and sides of pot, and replace the cover, but leave it slightly ajar. 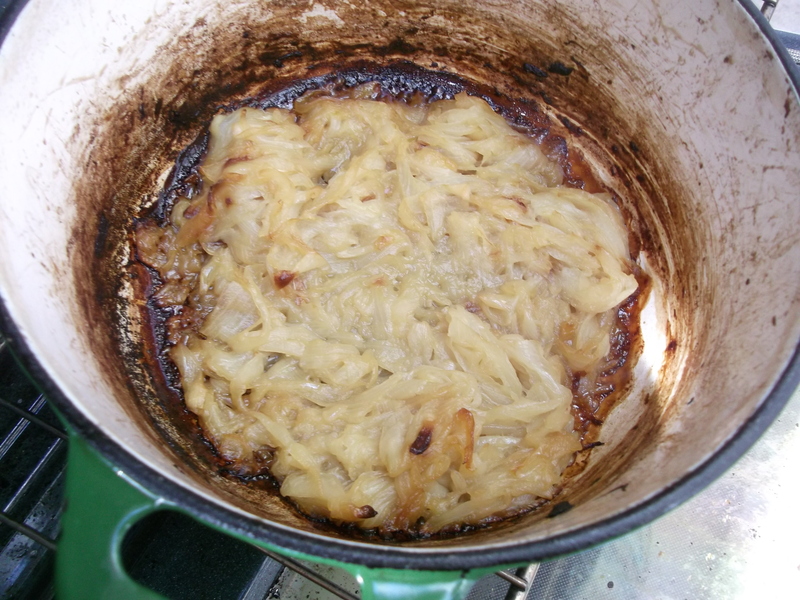 Continue to cook until the onions become very soft and golden brown, another 1½ to 1¾ hours. 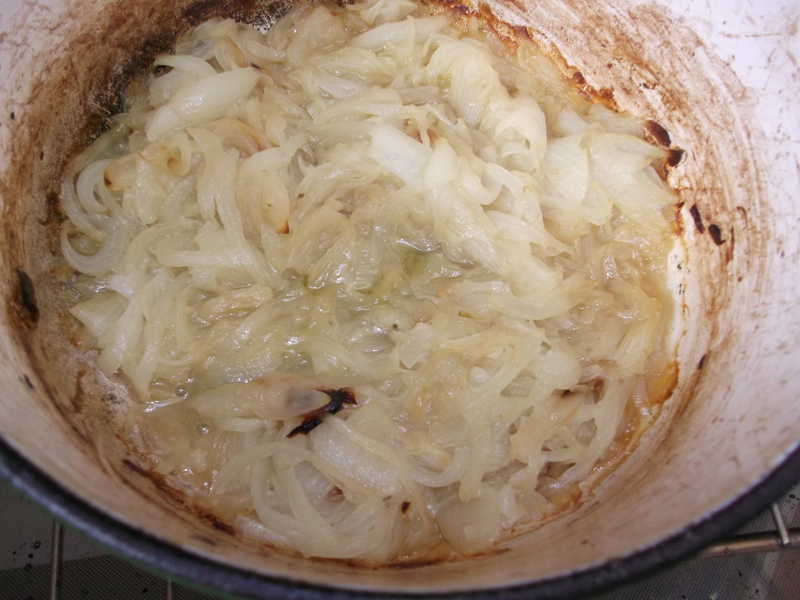 With a wooden spoon, stir the onions and scrape the bottom and sides of the pot every 30 minutes. After the first 30 minutes, they will have reduced a bit more, and will have started to turn golden. After the next 30 minutes, they will look like this: less volume, a little more color, and a brown crust will start to form on the bottom of the pot. After the next 30 minutes (this is the 1½ hour mark), they will have reduced further in volume and really browned, and there will be a lot of brown crust on the bottom. 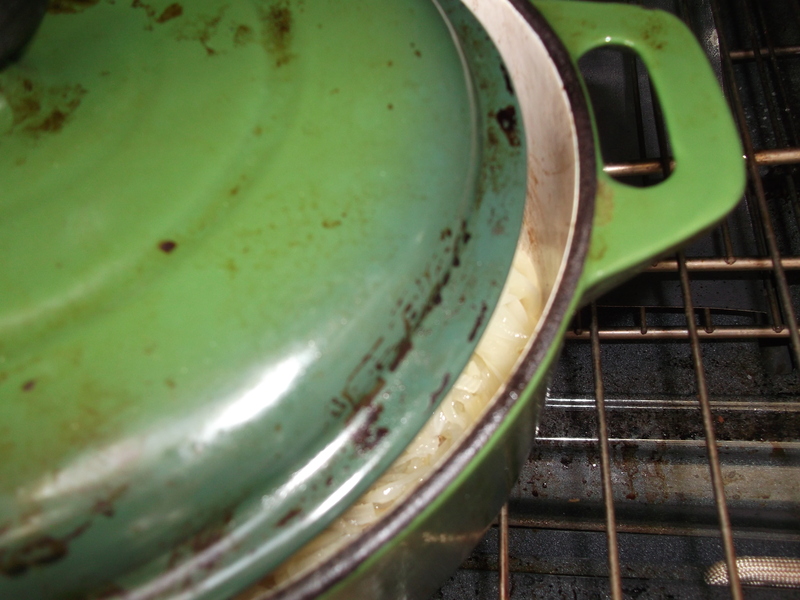 Remove pot from oven and place on the stove over medium-high heat. Cook the onions, stirring frequently and scraping the bottom and sides of pot, until the liquid evaporates and the onions turn really brown, about 10 to 15 minutes. Use a wooden spoon, and really scrape. 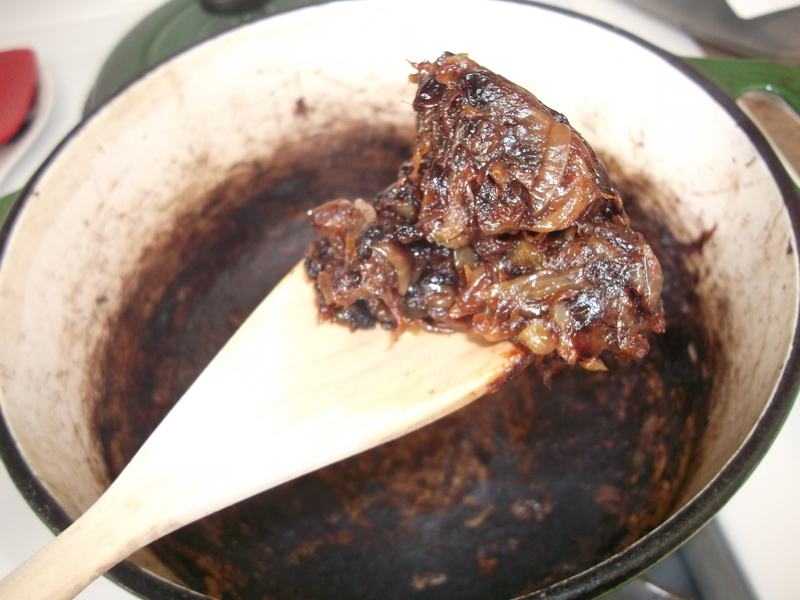 (Reduce heat to medium if onions are browning too quickly or start to turn black.) Continue to cook, stirring frequently, until the bottom of the pot is coated with a dark crust, 6 to 8 minutes. 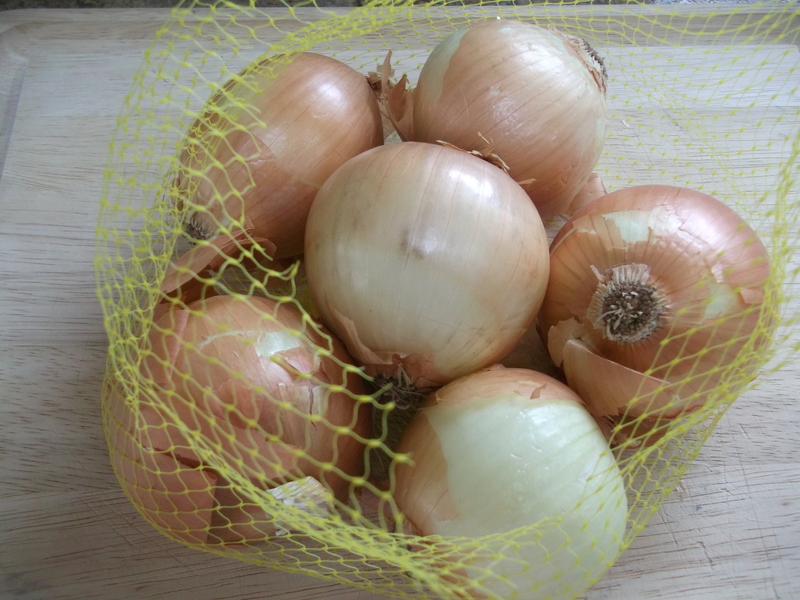 The onions are now ready to use. If using these for soup, the next step will be to deglaze the pan, which is described in my French onion soup recipe. Enjoy!